Steven (Chicagoland, United States) on 5 November 2012 in Transportation and Portfolio. With the autumn series behind me, I am finally back to the Pacific Coast Highway tour that was taken back in August. Here we are in Long Beach, California to visit and tour the Queen Mary. "Following sea trials and a royal tour, which Her Majesty Queen Mary had requested, the ship embarked on her maiden voyage from Southampton on May 27, 1936. Public interest was higher than ever and Britain's new grand vessel received a send-off from a crowd of over a quarter of a million." "The new liner soon earned an enviable reputation for outstanding service. Many passengers, including an array of royalty, politicians and celebrities, returned time and time again. The ship was like a village at sea, able to offer her passengers everything from banks and beauty parlors to a hospital and shops. There was even a resident gardener to tend the numerous potted plants, and a dog-walking service provided by the bell boys." "By March 1940, things were very different. Queen Mary was going to war. Her speed and size made her invaluable as a troop-carrier, and so her luxurious interior fittings were removed and replaced by bunks and extra sanitary facilities to accommodate service personnel. As the Second World War progressed, she voyaged to new areas of the world, and her capacity was further increased. On July 25, 1943, she carried an astonishing 16,683 people from New York to Gourock in Scotland, the greatest number to be conveyed on a single voyage, a record that still stands to this day. Queen Mary ended her war duties in September 1946, having carried 810,730 troops and steamed nearly 670,000 miles." 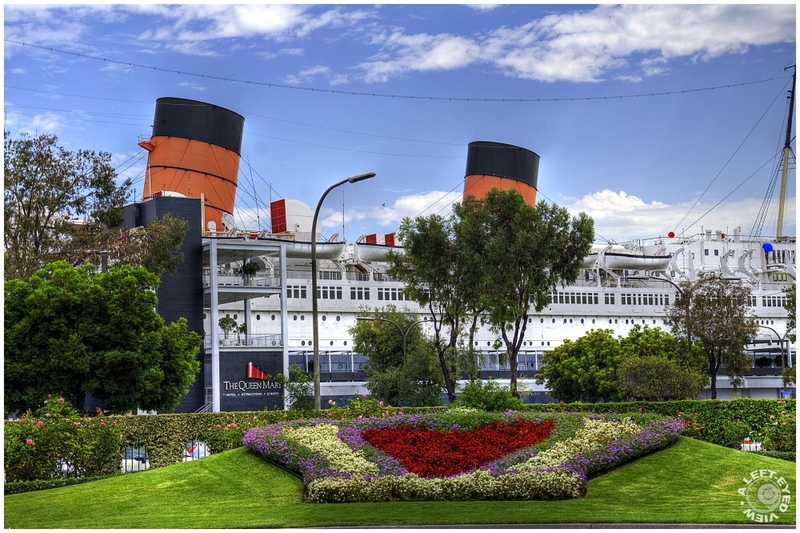 "Queen Mary was purchased by the City of Long Beach in California for $3.45 million. Queen Mary left Southampton for the last time in October 1967 watched by thousands of emotional well-wishers. Some 39 days later, the ship arrived at Long Beach and Captain John Treasure Jones gave the order 'Finished with engines' for the last time. As the ship retired, so did her captain. An era was all but over." A beautiful presentation, Steven ... we have friends who spent the night on her ... said it was absolutely charming! Nice shot to indicate the sheer size of her. Ah, yes, I remember the name John Treasure Jones - I see he died 1993, aged 87. Great to meet the fabulous queen Mary :-) Beautiful presentaion here! Very beautiful image with a stunning crispness. So this is the real stuff of the great liners. WOW! This is a beautifully composed image. This is a beautiful shot; plenty of color, excellent sharpness and perfect composition. Beautiful and elegant view ... a very glamorous shot! That is a beautiful shot! It looks so summery. That's a great shot with those massive stacks poking up. Great colors and detail. What an absolutely impressive sight. truly a ship with a history to remember! imagine carrying over 16,000 people at once ... what a horror had she been attacked and sunk! but now she can spend her retirement in peacefully and in gorgeous surroundings !